Sometimes reviewing an RPG involves a big time investment. In the case of Inotia 3, it took me well over a month just to finish the game. Is this a good thing however? Is playtime equal to how much fun I had? 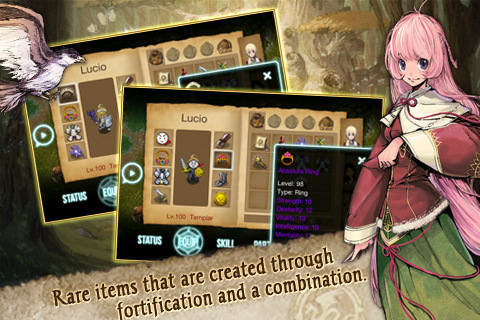 Find out as I review Inotia, a top-down Zelda style RPG, released by Com2us USA. Inotia 3 costs $4.99 and comes as a universal app for both iPhone and iPad. This review covers the iPhone version. The graphics are respectable. The main character portraits are very well drawn. Most of the environments have a nice cartoony look and feel, and there are a variety of enemy types. The in-game graphics remind me of Ragnarok Online characters with their large heads and 2D sprites in a real-time combat style RPG. You can fully customize the user interface like transparency, size of your health bar, positions, your attack buttons, and other elements. When you enlarge parts of the interface like your health and mana bar with character portrait, the image gets really blurry and ugly to look at. Large particle effects flow well and look relatively impressive and the different classes you can play give you unique attacks and tactics. It all comes together as a pretty good presentation. I’ve read about reports that there is bad stretching to the aspect ratio on iPad devices, so just fair warning. What moves the story in all RPGs? Quests. Quests need to flow and guide the player for the player to have any sense of challenge. Inotia 3 is very similar to the first versions of World of Warcraft. The quests are mostly “collect 10 blahs from the behs for some jerk who can’t do it himself”. It gets boring horribly fast. The first entire half of Inotia 3 is gathering quests. Kill monsters for the loot to drop at a semi-rare chance and pick up plants/rocks/other random stuff. It’s an uncreative way to progress levels and eventually, I start wondering what this has to do with any part of the story. You know what happened to World of Warcraft after Cataclysm released? Quest that progresses the story. You play a mission that leads you into an intense, world-changing chain of events that make you care about the characters (even a little). You collect 10 weapons from enemies and turn them in. Suddenly, the village has new gear to fight the enemy so you have a new mission where you and the villages go off to fight enemies, with you protecting them. They gain freedom from their oppressive enemies so now you gain access to the next city that trust you to cure their soldiers thanks to the reputation you have from the previous village. In Inotia 3, I moved from village to village and the main storyline was the only thing that held my attention. The enemies grew stronger and I had to grind on randoms just to match. The tedium loosened up a bit when the relatively interesting story kicked up and some plot elements became more important (no spoilers here of course). Character classes all are fun to play but leveling is a very slow process. Grinding on enemies really grinds on my patience so having new abilities would help. Gaining new moves can take days depending on how much you are willing to play per day. You can improve your equips but whenever you highlight a new item you cannot directly compare it to your current equipment. This is a basic feature that makes equipment more intuitive rather than a huge chore. You can’t reorganize your items if there are random gaps in between your potions. After a long time with Inotia 3, I can honestly say that it was very forgettable. The game is just not that interesting beyond the graphics. I really can’t recommend such an average yet pricey game. 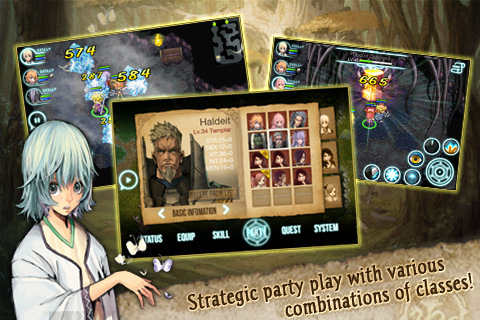 AppSafari review of Inotia 3: Children of Carnia was written by Joseph Ho on February 24th, 2011 and categorized under App Store, Games, iPad apps, RPG, Universal. Page viewed 5098 times, 2 so far today. Need help on using these apps? Please read the Help Page.